Bootstrap Tutorial for Beginners - Step by Step Guide! Bootstrap Tutorial for Beginners – Step by Step Guide! Bootstrap is a very useful front-end framework for faster and easier web development. You won't have to worry about having a decent user interface when you use it. I personally love this framework because I'm not into designing web app user interfaces, it solves a pain in me. That is why I made this Bootstrap tutorial for beginners. In fact, you can see my download and online tools sites. They are using Bootstrap. We are using Bootstrap for web application tutorials as well. One example is our PHP, MySQL and OOP CRUD Tutorial – Step By Step Guide! Just a little history, Bootstrap is created in twitter, it was called Twitter Bootstrap to streamline their development. Thanks to these people, the framework is still in active development. 8.0 Add Page Content Container. The following sections will be your step by step guide to your first web development with Bootstrap. There are two ways to use Bootstrap in a webpage. The second way is downloading and storing a copy Bootstrap files in our web server or local machine. You can download bootstrap here. I will show you how to use both in the next few sections below. Create new index.html file. Open the file, place the following code and save it. Place either of the following code between the "head" tags and under "closing title" tag. Make sure you downloaded bootstrap and put it in the same directory as your index.html, in my case, it is in the "bootstrap-3.3.6" folder. If you want to learn more about jQuery, we have our useful jQuery Tutorial for Beginners here. Place the either of the following code before the "closing body" tag. Make sure you downloaded jQuery and put it in the same directory as your index.html, in my case, the jQuery filename is "jquery-3.0.0.min.js". Bootstrap 3 is also a framework that is highly concerned with the mobile arena. It is responsive to different devices and screen sizes. Place the following code after the previous section's code. Navigation bars are so cool. Your users won't get lost on your website if you use them properly. Place the following code under the "opening body" tag. This "div" tag will contain and hold our web site's content. It is important because it defines the width of our content page. Our content won't be scattered when the visitor is using large screen size. Place the following code under the previous section's code. The heading is important because it tells the user what page he was in. Place the following code between the "container div" tags of the previous section. As you may have noticed, we used a "div" tag with a "col-md-12" class. This class enables the Bootstrap Grid System. Grid systems are used for creating page layouts through a series of rows and columns that house your content. See examples of Bootstrap Grid here and here. In this example, we have a table that will hold form elements like a text box. The bootstrap table looks good, has hover effect and is also responsive. Place the following code under the previous section's code. Our form example will hold few text boxes, a text area and select drop-down list. Replace the previous section's code with the following. Buttons with icons look cute. Well, at least for me. It also signals the user what the button is for. Button icon and color can easily tell what the button does in your web app. Place the following code between the "last td tags" of the previous section. You can also add some notes in a nice way using bootstrap. Place the following code before the "opening div tag" of the previous section. <strong>Heads up!</strong> This bootstrap page example is from Mike Dalisay of <a href="https://codeofaninja.com/">codeofaninja.com</a>! If you download the source code, aside from the complete source code of the tutorial above, you will get the following as well. index-cdn.html Makes use of Bootstrap framework in CDN. Will work if your computer is online only. index-local.html Makes use of a Downloaded Bootstrap framework (no CDN). Works on your localhost. Will work even if your computer is offline. You can download all the code used in this tutorial for only $9.99 $5.55! Live websites built with bootstrap. Yes, there are also Bootstrap plugins. Admin or dashboard themes will give you the ability to focus on developing the core functions of your web application. You can find Bootstrap dashboard themes here. If you decide to study more source codes about bootstrap and want to build a website using it, you can find Bootstrap website templates here. Up Next: Learn jQuery Tutorial for Beginners – Step By Step Guide! If you have a friend who need help and is getting started to learn Bootstrap, please share this article with them. Is there anything else I can do to improve this post? Please share your thoughts on the comments section below. 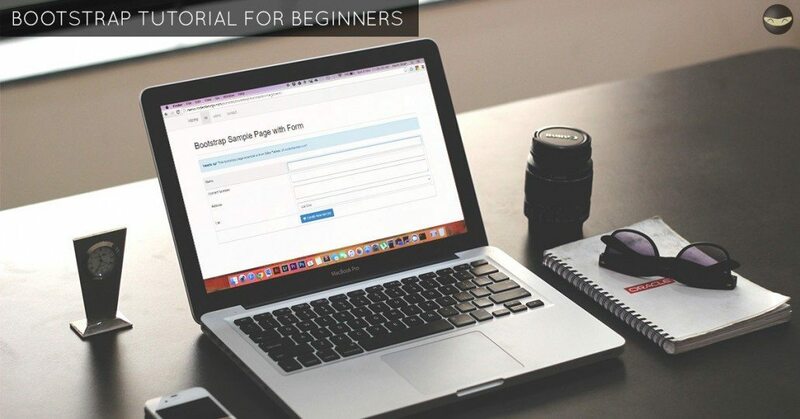 Thanks for reading our bootstrap tutorial for beginners! 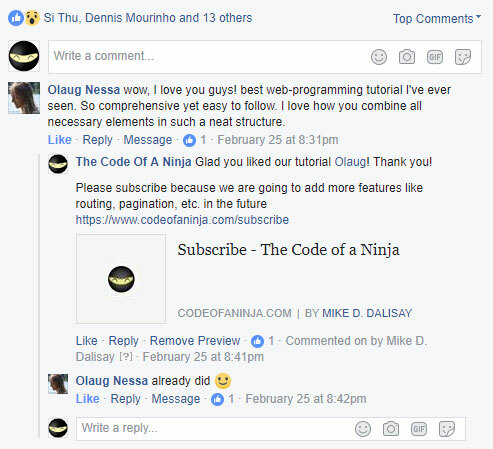 https://www.codeofaninja.com/wp-content/uploads/2014/05/bootstrap-tutorial-beginners-step-step.jpg 628 1200 Mike Dalisay https://www.codeofaninja.com/wp-content/uploads/2019/03/codeofaninja-with-text-3-1030x206.png Mike Dalisay2014-05-20 14:09:472019-04-10 21:01:25Bootstrap Tutorial for Beginners - Step by Step Guide! Thanks @disqus_n0Cr06hej7:disqus, glad you found it useful! I’m glad you found it a good one @disqus_a6h6fY0Vrx:disqus! Please share this to your friends! Wow, thanks for the feedback @disqus_6kbQcMxiUx:disqus, it makes me want to create more tutorials like this. Thank you! Thank you for visiting and your kind words @rahulmakhare:disqus ! Hello @smil@smileykhush:disqus, you’re welcome! Thanks for the kind words, glad you found out tutorial clear. Please share to your friends if you have time. Thanks @Namraj, glad you liked it! Thanks for the kind words @disqus_K6SjBNxdKx:disqus! Please subscribe https://www.codeofaninja.com/subscribe or share our site to one of your friends if you have time. Thank you! Nice tutorial, Thank you for the great work. Thanks for the kind words and you’re welcome @shahid_aleem:disqus ! Sir I want to create custom creative nav bar , I am the begainer of bootstrap How can I ?? Hello @joydiponmukherjee:disqus , you should learn CSS first. Thanks for your feedback @shannawaz:disqus ! One of the best tutorials I have used. Thank you. I am very new at programing, yet I just used bootstrap on my page. Flipping cool. Thanks @codeecyy:disqus! We used the class ‘table-responsive’ on the table above, it should fit your screen. Try to use CSS on the table as well, it should look like style=”width:50%;”. If that worked, create a CSS class for that.